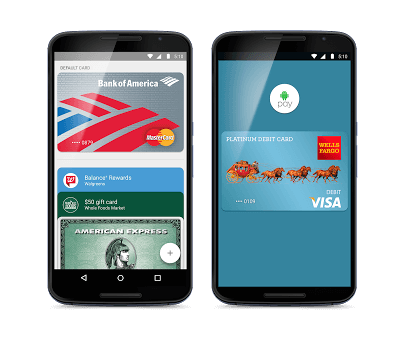 After months of waiting and a few days of activity around the Google Wallet app, Google has formally launched Android Pay. The new service, which was announced this summer at Google I/O, brings terminal payment, credit card management and gift card management to Android phones and tablets with NFC capabilities to dozens of retailers in the United States. Today, we’re beginning to roll out Android Pay — the simple and secure way to pay with your Android phone at over one million locations across the US. Android Pay also stores your gift cards, loyalty cards and special offers right on your phone. Android Pay is aimed directly at Apple’s Apple Pay solution and allows users to safely and securely pay for purchases from their phones without ever having to pull out a credit or debit card from their wallet. Sprouts, PetCo, Subway and Staples. Security, as with any NFC payment solution, is critical for Android Pay and Google has had this at the forefront of the design. We know how important it is to keep your personal and financial information secure, so Android Pay is supported by industry standard tokenization. This means your real credit or debit card number isn’t sent with your payment. Instead, we’ll use a virtual account number that provides an extra layer of security. As soon as you make a purchase, you’ll see a payment confirmation that shows where a given transaction happened, so it’s easy to catch any suspicious activity. The new service is rolling out now and there will be an update to the Google Wallet app (the old one as I predicted yesterday) which will be coming to the Google Play Store in the coming days. If you do not have the current Google Wallet app you can download it using the button below. Having used the new service multiple times, it is easy to use and pretty pain free. All you have to do is make sure your phone is unlocked but you do not necessarily have to have the Android Pay app open. Once the transaction is ready to be paid, hold your phone over the NFC compatible payment terminal and you will get a notification on your phone to approve the payment. Tap the check mark and you are done. Afterward, you can look inside the app to see a receipt for the transaction.